Batman has a bit of a rep among comic fans for being... well, a bit unbeatable. Always with a plan, always finding a way to succeed against impossible odds, for a mortal, Batman can stand alongside gods and do just dandy. However, today’s Justice League #42 leans into that reputation... quite literally. Spoilers, of course, for Justice League #42. The Justice League comic is picking up with the threads left off before DC’s Convergence event—with an event of its own, Darkseid War. A conflict between the Anti-Monitor and Darkseid (as well as his Darkseid’s daughter) has left the League caught in the middle between the New Gods, and the conflict in Justice League #42 sees one of those gods, Metron the God of Knowledge, get separated from his powerful, all knowing floating space-time magical chair. You know, as you do. The League attempt to stop the chair before it teleports itself away, leaving Metron and themselves at the mercy of the Anti-Monitor. So... Batman sits on it. Finally, after many years of people snarking that Batman might as well be a god, Batman (specifically Bruce Wayne, rather than the current Batman rolling around in the comics) is now actually a god. We can stop joking! Oh dear. That’s not going to go down well. 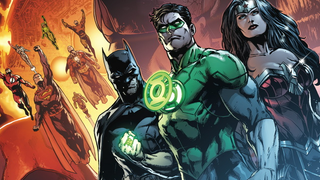 Given how radically different Justice League is at the moment in comparison to the shakeups in DC’s other comics, it’s easy to assume that this is a temporary position for Batman. But if he actually remembers the Joker’s real identity going forward, we’re in for some good old fashioned comic book madness in the near future.